Looking for a gift that truly shows you care? Give the gift of infrastructure! The Chicago Department of Transportation (CDOT) has announced it is offering up one of its historic bascule bridges for free to any state, local or responsible entity willing to haul it away. Built in 1914 by the Ketler-Elliot Erection Company of Chicago, the Chicago Avenue Bridge spans the north branch of the river and is one of many pony truss style bascule bridges. The bridges’ leaves are suspended on axles underneath the street, with the counterweight hidden within a riverbank pit tucked behind a limestone enclosure. This type of bridge was developed in Chicago in 1900, with the first one constructed in 1902 still in operation at Cortland Street and the Chicago River. Bascule bridges opened easily and did not obstruct the river with a central pier, a must to accommodate a busy early 20th century waterway serving Chicago’s commercial route to the Mississippi River system. The bridge replacement is a component to proposed traffic improvements along Chicago Avenue in advance of the construction of One Chicago Square, a massive 869 residential structure proposed at State Street and Chicago Avenue. Designed by Goettsch Partners and Hartshorne Plunkard Architecture, One Chicago Square calls for two glassy towers atop a podium, the tallest of which tops out at 1,011 feet, making it what could be Chicago’s sixth tallest building. The future owner of the bridge assumes all costs for moving the bridge and maintaining historically significant features. The City of Chicago intends to replace the bridge with a modern concrete and steel structure this fall. Those interested must submit a proposal by July 13. Thus far, the CDOT has received no offers for the bridge. 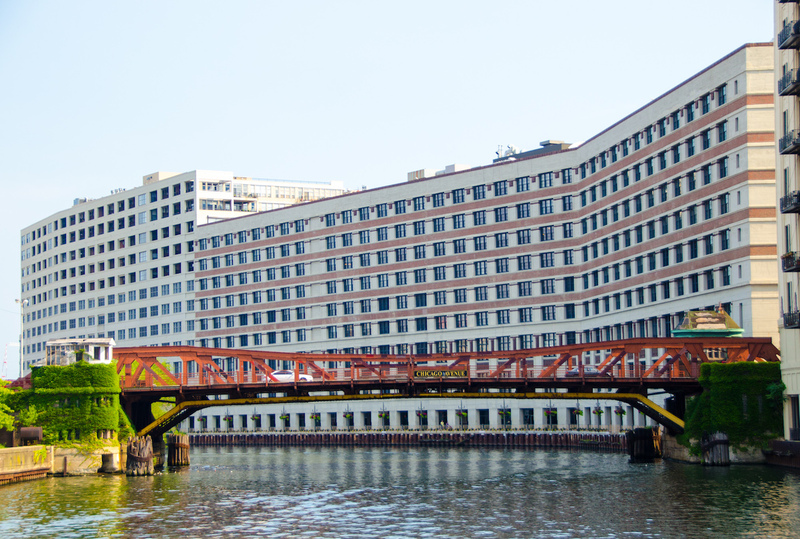 The bridge comes with a determination of eligibility for the National Register of Historic Places (NRHP), which requires the City of Chicago to make a reasonable effort to offer the bridge up for restoration to interested parties. The gift includes the embedded counterweights and the two bridge houses.